Just lately I've been thinking I might take a couple of weeks break from writing my thesis, and head to the Eastern States in October. The plan is to fly to Sydney, and then hire a car to drive up into the Blue Mountains, down to Canberra, through the Yarra Valley, and along the Mornington Peninsula, flying back to Perth from Melbourne. So my question is about book shops or charity shops that anyone can recommend along this route. There are places I already know that I must visit. 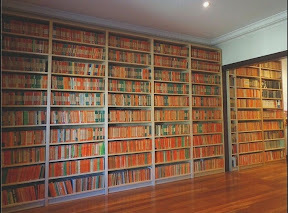 I have seen a photograph of the display of green Penguins at Gould's; Whispering Gums once told me about a great bookshop in Canberra; there is a wonderfully inexpensive secondhand bookshop run by Gail in Holbrook; and I have memories of a bookshop with a wall of Penguins in Healesville. But are there any others? I would love to hear about them. Vintage Penguin (and Pelican)-wise it has been a great week for me, but then this is the one time of year when I can be reasonably certain that it will be. The Save the Children Fund have been holding their annual book sale at the University of Western Australia (which I wrote about here last year). My whole week has been organised around their book sale: I've been down there four times over the past six days, and I ended up with 144 more books, all published by Penguin prior to 1970 (and I have to thank John Mack, who spotted me in the queue on Friday, and gave me one more). Perhaps perversely my favourite finds were books I may never get around to reading. They were a collection of Science Surveys with wonderful covers designed by F.H.K. Henrion, which I have posted here. These books all bear their owner's name. Clearly he kept them all his life, and I like the fact that they have now come to me, as I have no plans to ever part with them. And I loved the cover of the 1958 Pelican A417 (Recorded Jazz: a Critical Guide by Rex Harris and Brian Rust) I found on Sunday. You will have a great time and no doubt will find lots of Penguins. In Sydney go down Glebe Point Rd to Glee books second hand shop. The second hand shop next door is too expensive. Glee second hand books is about 3 blocks down from Glee New books (indie shop). Cornflower books might have some too and be sure to haggle as it works in there easily. 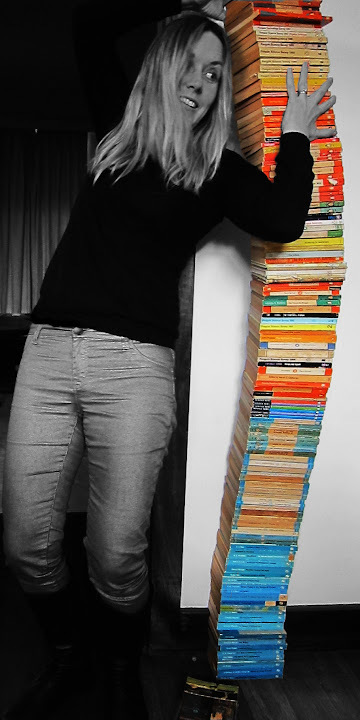 That's a beautifully impressive tower of books! Good hunting on your travels! I also love the fact that you're keeping collections of books together - I'm a bit like that too :) I've often come across books in charity shops which obviously came from the same home and sap that I am, I often take them back to my library even if I don't really need all of them!! I don't really know where they source all these books from each year, but I imagine that some proportion of them come from deceased estates. A few years back I noticed that several I had bought had come from the same owner, and I could trace the course of the woman's life as she had listed her address on the books over the years, and she was sufficiently well known that her obituary had been published online. Those books I particularly value, as I know where they have come from, and I know the previous owner valued them enough to hold onto them all her life. I'm still amazed by that picture :p Love it!! Have a great time hunting for more!!! Thanks Chris - I just need to work out if I can airbrush myself out of it, so that I end up with a tower of teetering books. diversity books in mentone has lots of penguins & pelicans, all $1 for their going out of business sale. but they will have closed for good by the end of september. It's probably out of your way, but Book Heaven (47 Main Road Campbells Creek), just outside of castlemaine (90 mins nthwest of melbourne), has loads of old penguins and pelicans, and books there are fairly cheap. As for op-shops, there are several on the Bentleigh shopping strip in Centre rd, along with a bookshop with old penguins in the back of the arcade at 325 Centre rd Bentleigh. Cheltenham also has four op-shops within walking distance, and you will find one in each shopping strip as you head down the Nepean hwy on the way to Frankston and the Mornington Peninsula. Oh, and Tyabb Packing House antiques market has a large bookseller with lots of penguins. Thank you so much - this is just wonderful, and timely, as I'm just booking my accommodation in Victoria at the moment, and trying to plan the best route. I was thinking of The Great Alpine Rd, until someone else mentioned the Castlemaine book shop on instagram (and I read about the continuing Victorian snow season), and so a deviation to the goldfields might be tempting. And I'm so glad you mentioned the Tyabb Packing House markets, which I'm sure I wouldn't have found, because the accommodation near Frankston is booked. Oh well, if you had the time, and were in the area, there are a few decent bookshops in the goldfields region. Bendigo has Book Mark on the main drag (some penguins, lots of fiction), and Book Now (wider selection, fewer penguins). Daylesford has two, one by the lake and another in town, but I haven't been there in years so couldn't guess at the stock. As for the Tyabb packing house, there are other antiques markets along the Mornington-Tyabb rd, each of which has some books, but prices vary a lot. The Packing house has the largest selection. Wherever you end up going, good luck with your trip and I hope you find lots of Penguins! I'm happy about every vintage Penguin which is saved from being discarded, so I think it is wonderful that some green Penguins are now on your book shelf. Of these, the only one I have read is Tom Brown's Body, but I was not impressed, although I note that others enjoy the books of Gladys Mitchell (perhaps I started with the wrong one, I have not been game to try her again).